Cutting to the nasty little secrets underlying modern life, Warmduscher bring forth a new single, Big Wilma. 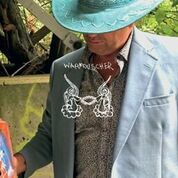 An interesting mix of In-your-face punk and sinister electronica, the new tracks from Warmduscher don’t disappoint. Big Wilma is pulse-quickening, fast and furious alternative rock. Suitably hysterical vocals from Clams Baker are driven by a great, barrelling bombast of sound. A forceful reminder of how good Warmduscher are. Neon Tongues feels more like Warmduscher on Khaki Tears. A single repeating electronic note starts the menacing electronica, the vocals spoken softly over the baleful sounds. There is an undercurrent of dystopia played in an understated and distant way that only adds to the atmosphere of this excellent track. No one soundtracks the crumbling American dream better than Warmduscher. For those new to the band, their members have an interesting back story full of plenty of dirty little musical secrets. The South London scene, centred around venues like The Windmill in Brixton, sees people explore the different sides of their musical interests in multiple bands. With this in mind, Warmduscher has Clams Baker (Mutado Pintado/Paranoid London) Lightnin’ Jack Everett (Fat White Family) The Saulcano (Insecure Men, Fat White Family) and Mr. Salt Fingers Lovecraft (Childhood, Insecure Men) The Witherer aka Little Whiskers (Paranoid London) bringing this superbly sordid offering forth into the dysfunctional grimness of modern life. A band full of interesting pseudonyms and filthy sensibilities. The single was produced by Dr Dan Carey and is released on The Leaf Label. One of the more intriguing and disturbing singles you should buy this year. Dish the dirt at Facebook, Instagram, and their website.